Ph.D. in Electrical Engineering, 1994, Politencnico di Torino. Giuseppe Caire was born in Torino, Italy, in 1965. He received the B.Sc. in Electrical Engineering from Politecnico di Torino (Italy), in 1990, the M.Sc. in Electrical Engineering from Princeton University in 1992 and the Ph.D. from Politecnico di Torino in 1994. He was a recipient of the AEI G.Someda Scholarship in 1991, he was with the European Space Agency (ESTEC, Noordwijk, The Netherlands) in 1994-1995 as research staff and, as research fellow, Princeton University in 1997 and Sydney University in summer 2000. He served as Associate Editor for the IEEE Transactions on Communications in 1998-2001 and as Associate Editor for the IEEE Transactions on Information Theory in 2001-2003. 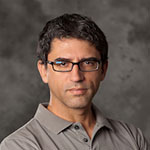 He received the Jack Neubauer Best System Paper Award from the IEEE Vehicular Technology Society in 2003, and the Joint Information Theory/Communications Society Best Paper Award in 2004. He was elected in the Board of Governors of the IEEE Information Theory Society in 2004 and was elected IEEE Fellow in 2005.